IT’S 530AM as Yeo Buck Chwee leaves his three-bedroom apartment at Clementi Avenue 4. The 85-year-old enjoys a cup of kopi-O or black coffee at the nearby coffeeshop before heading down a bougainvillea-lined path towards Ulu Pandan Park Connector. But instead of joining the other early risers who gather at the scenic water-front park to cycle or practise tai chi, a form of Chinese martial arts, Yeo passes a sign that reads ‘Private Land, Trespassers will be Prosecuted’ to reach his ‘second home’. Set along an abandoned railway track owned by KTM Malayan Railway, this home is literally just a roof over his head – a hut consisting of zinc panels held up by metal scaffolding. Around it are farm plots where he spends his mornings weeding and watering rows of sweet potato plants, as he has been for the past three decades. But he is not alone. This place is also home to some 30 senior citizens who visit daily. 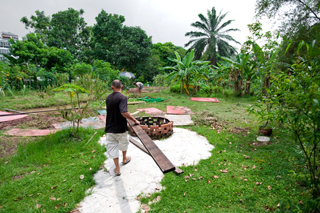 Affectionately known as Kampung Sungei Pandan to them, they gather here to farm or chit-chat over cups of tea. Kampung Sungei Pandan sits on land the size of two soccer pitches. 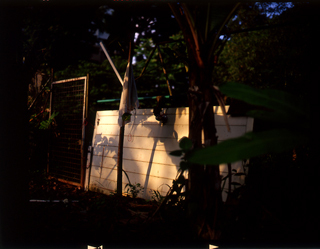 It is located at Clementi Avenue 4, above a gas pipe that belongs to the Public Utilities Board. The collection of farm plots is bordered by HDB blocks, the Clementi Avenue 6 flyover and Sungei Ulu Pandan. It runs along the KTM Malayan Railway built on land belonging to Malaysia, thus making it difficult for Singapore’s authorities to develop the site. Hence, the state has left it alone... or at least for now. Kampung, which means village in Malay, also refers to a rural way of life in Singapore that has made way for today’s modern living. “Being out in the fields gives me a break from the four concrete walls of my home,” Yeo explains. He likens the open spaces of Kampung Sungei Pandan to those at his old village along Sixth Avenue, now a prime real estate area where million-dollar properties stand. Yeo and most of the regulars were relocated in the late 1970s under the nation’s urban renewal programme. Nicknamed Ah Or, a reference to his tanned complexion in Hokkien, he prefers the kampung setting to the air-conditioned rooms found at the nearby Clementi Community Centre, which conducts many activities for senior citizens like him. There, for less than $100, Ah Or can pick up calligraphy or learn to play the guzheng, a traditional Chinese string instrument. Yet, even if they were for free, Ah Or would not be the least bit interested. “Community centre activities and elderly-friendly exercise parks are boring,” he says, adding that he enjoys spending time at Kampung Sungei Pandan as it gives him the freedom to pursue what he wants, when he wants to. Many years ago, 10 other farming enthusiasts, including 53-year-old Cai, took the cue from Ah Or and began growing sweet potato and yam on adjacent plots. They became fast friends, tilling each other’s lands and even arranging barbeque get-togethers at the hut. Back then, armed with crude tools and determination, Cai and his friends cleared weeds and chased out snakes from the once-vacant plot of land. They also raised funds for the setting up of a Taoist altar and purchased potted plants, carpet grass and a lawn mower. Undisturbed by any concrete structures, regulars like the freedom of space that Kampung Sungei Pandan provides. Urban sociologist Ho Kong Chong cites the kampung as an example of how people can create places of their own, a process he calls “place making”. The professor from the National University of Singapore (NUS) also suggests that the kampung has fostered a sense of community among residents through the sharing of memories. “When people intermingle or pursue a common activity, there is a possibility that they will move on to negotiate and solve problems together,” Prof Ho says. “Urban planners should think beyond just constructing static spaces that are void of character and instead place more attention on the nurturing and retaining of social spaces, such as the kampung,” he adds. In 2000, word spread that someone had struck lottery after giving offerings at Kampung Sungei Pandan’s Taoist altar. This news attracted visitors from as far as Changi, and a flood of donations allowed the devotees to convert the altar into an elaborate concrete shrine. But this also caught the attention of the land owners. Cai recalls the day in 2002 when the Malayan Railway authorities came by for the first time and ordered the demolition of the shrine. Since then, the devotees have left Kampung Sungei Pandan in a dilapidated state. They are unwilling to rebuild the place for fear of a second clampdown. In this manner, there is a lack of a long-term relationship with the physical environment, says urban planning expert Ooi Giok Ling. This discourages a sense of ownership among residents and they become unwilling to spend time and effort on its maintenance, she says. The place has been left dilapidated since the first clampdown in 2002 as regulars do not want to see their time and effort go to waste again. “This hampers grassroots planning activities and gives the space a temporary look, exactly the kind of problems that the authorities dread as it is untidy,” adds the professor from the Nanyang Technological University. For Florence Ghng, who gets a bird’s eye view of Kampung Sungei Pandan from her 10th floor apartment, the sight of brown muddy ponds and messy zinc roof panels isn’t a pretty one. But the 48-year-old hardly seems to mind. Having moved into her apartment at block 305 in 2001, Ghng recalls how her elderly father noticed the vegetable plots downstairs and wished he had such a kampung under his own block. But unlike Ghng, not all residents have been supportive of the kampung. Over the years, others have complained about dengue threats at the compound, leading to frequent visits by officials from the town council and the National Environment Agency. In order to quell such fears, 58-year-old Sunny rears fishes in the ponds to prevent the breeding of larvae. The regular at Kampung Sungei Pandan is thankful that besides these checks, the authorities have pretty much left him alone. Petition what? the landownership is in dispute. Better to not publicize this situation and let the group quietly appropriate the space. The authorities conducted the site visit due to complaints, so the effort must be made to include the surrounding neighbourhood, those that might be inconvenienced by this “kampung”.